(Korean): The 7FS was reactivated on 15 May 2008 and equipped with the Lockheed- Martin F-22A Raptor. They were the first of two F-22 squadrons to be activated at Holloman AFB, NM. The squadron was equipped with 18 F-22s transferred from the 3d Wing at Elmendorf Air Force Base, Alaska, the last aircraft being received in late 2009. After its reactivation, the 7FS deployed frequently to overseas locations in support of US objectives and are better known as the "Screamin' Demons". Operating the F-22A Raptor, the squadron provided air dominance in the world's most dangerous threat arenas. 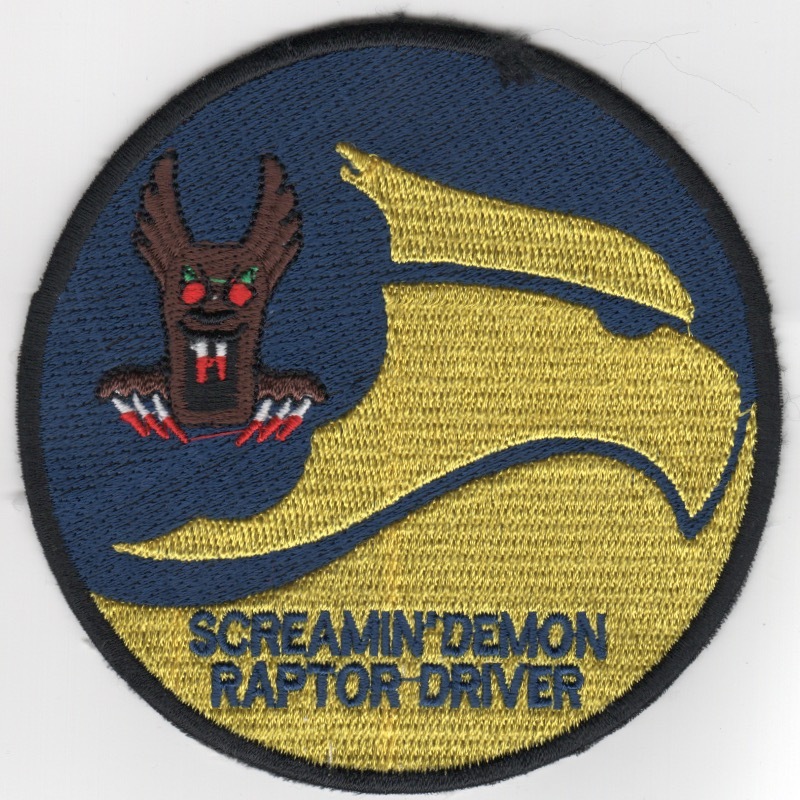 This is the "DARK YELLOW" version of their "Raptor Driver" patch and was found in a Korean embroidery shop in very limited quantities. This patch does not come with velcro attached. (Korean): The 7FS was reactivated on 15 May 2008 and equipped with the Lockheed- Martin F-22A Raptor. They were the first of two F-22 squadrons to be activated at Holloman AFB, NM. The squadron was equipped with 18 F-22s transferred from the 3d Wing at Elmendorf Air Force Base, Alaska, the last aircraft being received in late 2009. After its reactivation, the 7FS deployed frequently to overseas locations in support of US objectives and are better known as the "Screamin' Demons". Operating the F-22A Raptor, the squadron provided air dominance in the world's most dangerous threat arenas. 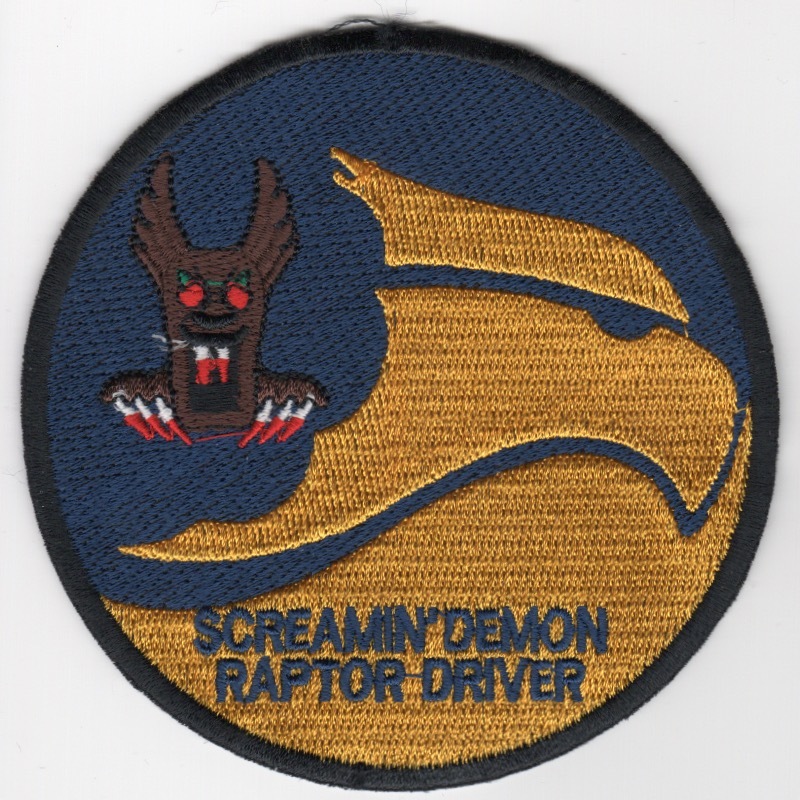 This is the "LIGHT YELLOW" version of their "Raptor Driver" patch and was found in a Korean embroidery shop in very limited quantities. This patch does not come with velcro attached. (Korean): The 7FS was reactivated on 15 May 2008 and equipped with the Lockheed- Martin F-22A Raptor. They were the first of two F-22 squadrons to be activated at Holloman AFB, NM. The squadron was equipped with 18 F-22s transferred from the 3d Wing at Elmendorf Air Force Base, Alaska, the last aircraft being received in late 2009. After its reactivation, the 7FS deployed frequently to overseas locations in support of US objectives and are better known as the "Screamin' Demons". Operating the F-22A Raptor, the squadron provided air dominance in the world's most dangerous threat arenas. 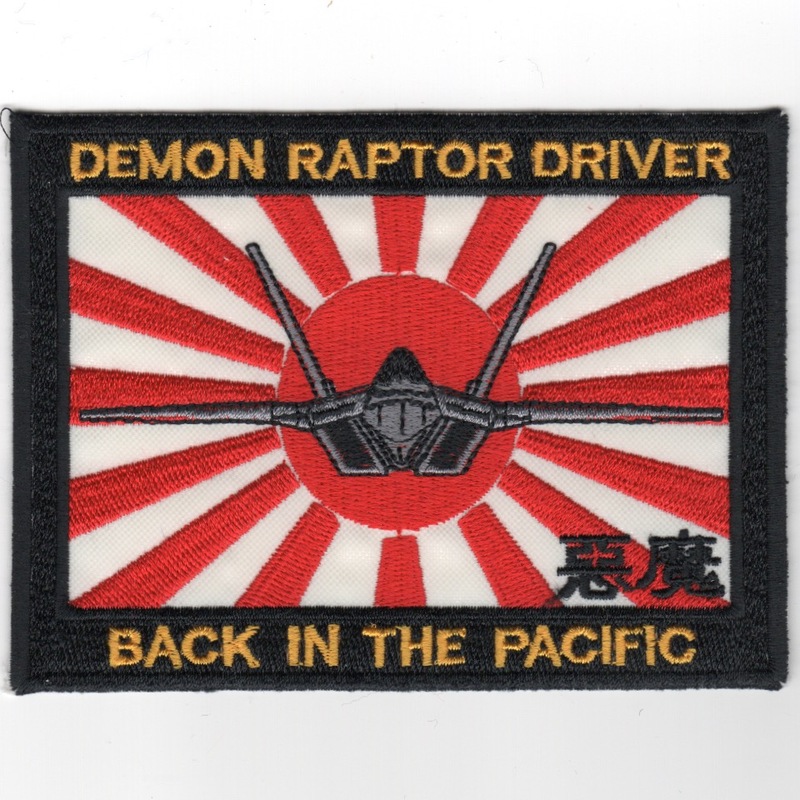 This is the "Red-White Sun" version of their "DEMON Raptor Driver" patch and was found in a Korean embroidery shop in very limited quantities. This patch does not come with velcro attached. (Korean): The 8FS is an active USAF squadron, assigned to the 54FG, stationed at Holloman Air Force Base, NM and equipped with the Lockheed Martin F-22A Raptor. The 8FS was the second of two F-22A squadrons to be at Holloman, joining the 7FS. The squadron was equipped with 18 F-22s, the last aircraft being received in 2010. 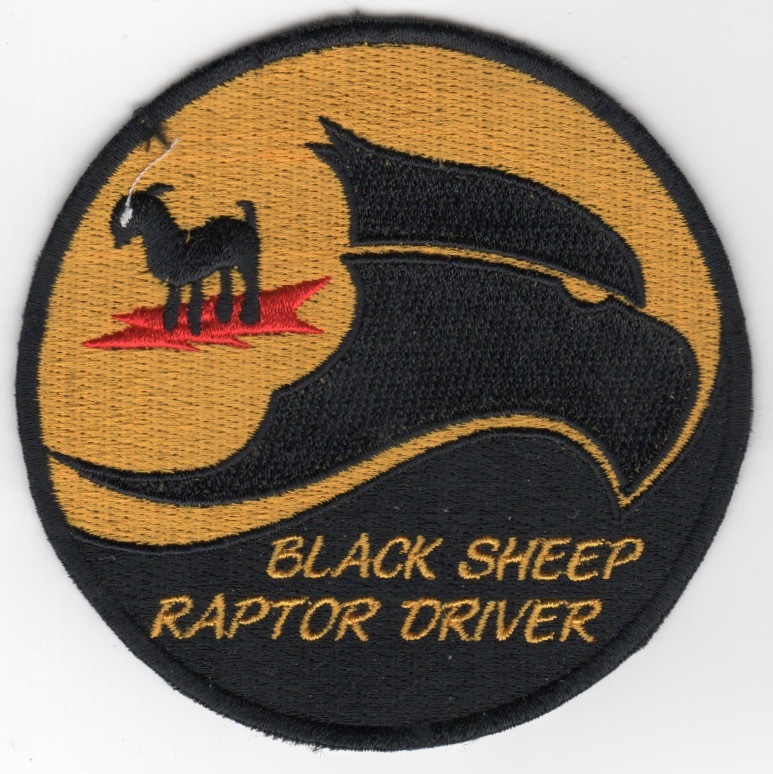 This is the "Yellow/Black" version of their "Raptor Driver" patch and was found in a Korean embroidery shop in very limited quantities. This patch does not come with velcro attached. 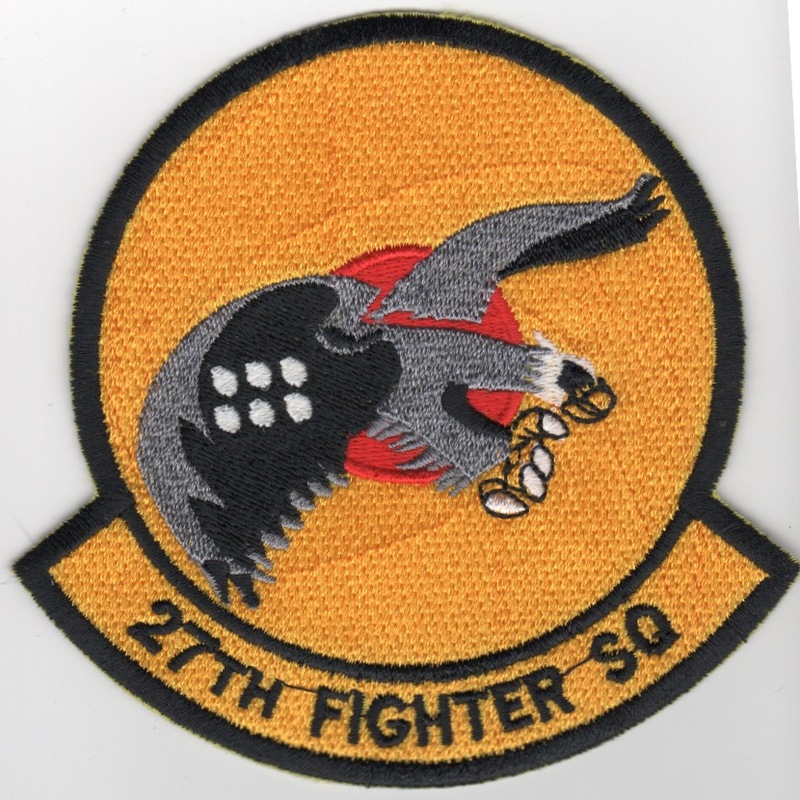 (Korean): The 27FS is a unit of the USAF 1st Operations Group located at Joint Base Langley�Eustis, VA. They are equipped with the F-22 Raptor and is the oldest active fighter squadron in the USAF, with over 95 years of service to the nation. It was organized as the 21st (later 27th) Aero Squadron on 15 June 1917 at Kelly Field, Texas. The squadron deployed to France and fought on the Western Front during World War I as a pursuit squadron. It took part in the Champagne-Marne defensive, Aisne-Marne offensive, St. Mihiel offensive, and Meuse-Argonne offensive. During World War II, the unit served in the Mediterranean Theater of Operations (MTO) as part of Twelfth Air Force as a P-38 Lightning fighter squadron, participating in the North African and Italian campaigns. During the Cold War, it was both an Air Defense Command fighter-interceptor squadron and later as part of Tactical Air Command. It was the first USAF operational squadron equipped with the F-15A Eagle in January 1976. This patch was found in a Korean embroidery shop in very limited quantities and has that "in-theater" feel to it. This patch does not come with velcro attached. (Korean): The 27FS is a unit of the USAF 1st Operations Group located at Joint Base Langley�Eustis, VA. They are equipped with the F-22 Raptor and is the oldest active fighter squadron in the USAF, with over 95 years of service to the nation. It was organized as the 21st (later 27th) Aero Squadron on 15 June 1917 at Kelly Field, Texas. The squadron deployed to France and fought on the Western Front during World War I as a pursuit squadron. It took part in the Champagne-Marne defensive, Aisne-Marne offensive, St. Mihiel offensive, and Meuse-Argonne offensive. During World War II, the unit served in the Mediterranean Theater of Operations (MTO) as part of Twelfth Air Force as a P-38 Lightning fighter squadron, participating in the North African and Italian campaigns. During the Cold War, it was both an Air Defense Command fighter-interceptor squadron and later as part of Tactical Air Command. It was the first USAF operational squadron equipped with the F-15A Eagle in January 1976. 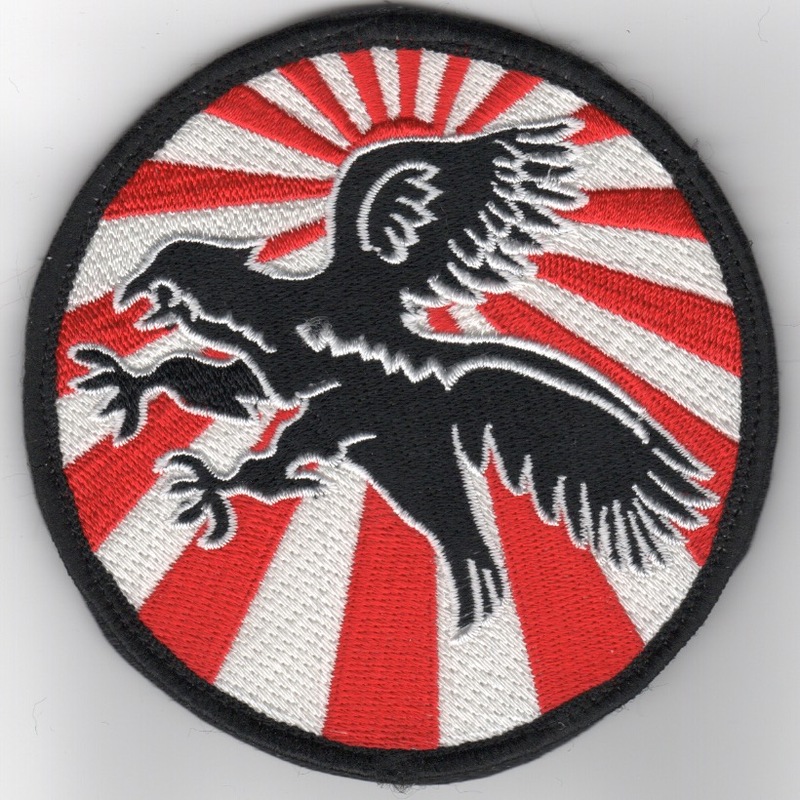 This patch shows the 'Black Falcon' with it's Talons in attack position with the red-white rays of the setting sun typical of the Pacific theater. This patch was found in a Korean embroidery shop in very limited quantities and DOES come with velcro attached. (Korean): For the history and lineage of the 27FS, please note the details above. 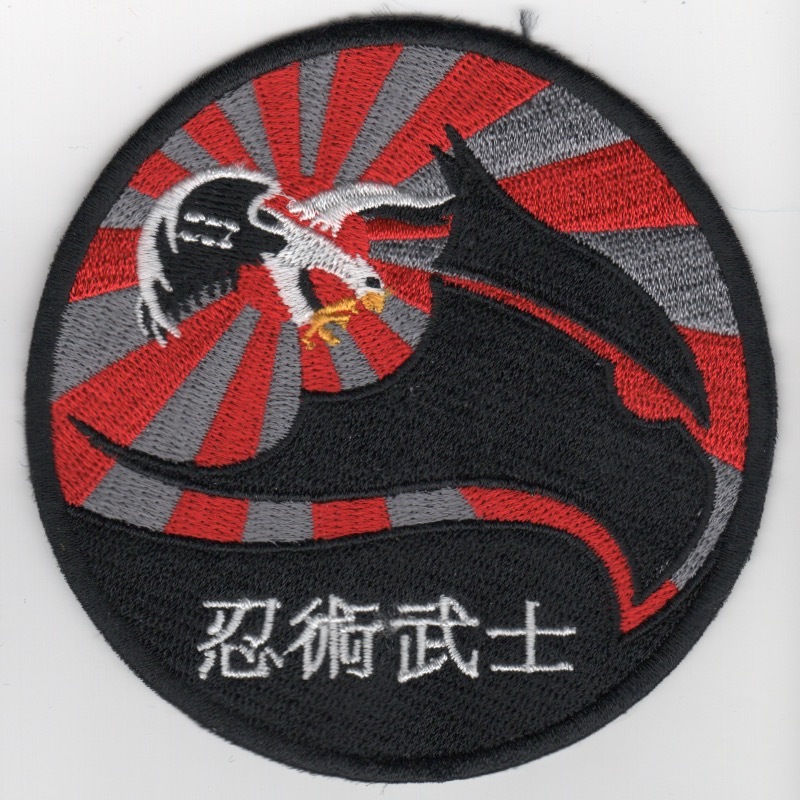 This patch shows the 'Raptor' with it's Talons in attack position behind the head of a black bird-head with the red-GRAY rays of the setting sun typical of the Pacific theater in the background with Korean script (different than that one below) along the bottom. This patch was found in a Korean embroidery shop in very limited quantities and does not come with velcro attached. (Korean): For the history and lineage of the 27FS, please note the details above. 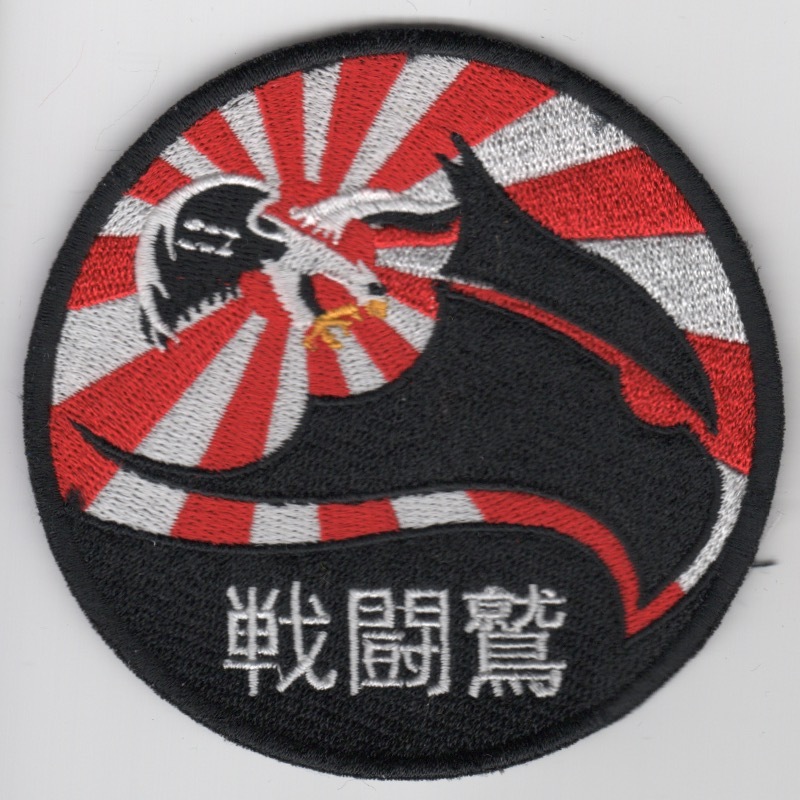 This patch shows the 'Raptor' with it's Talons in attack position behind the head of a black bird-head with the red-WHITE rays of the setting sun typical of the Pacific theater in the background with (A DIFFERENT THAN ABOVE) Korean script along the bottom. This patch was found in a Korean embroidery shop in very limited quantities and does not come with velcro attached. Homepage | Order F-22 Squadron Patches!